Over the last year my daughter has told me on multiple occasions that I had lost my wild, and although I knew I hadn’t there was this nagging voice in my head that made me question whether I had any wildness left inside me. I wasn’t going to let anyone tell me that I had lost my wild; let alone my own daughter. I had raised her camping and hiking in the great outdoors and to this day I still camp more than she does, and I can make one mean campfire without the assistance of lighter fluid. 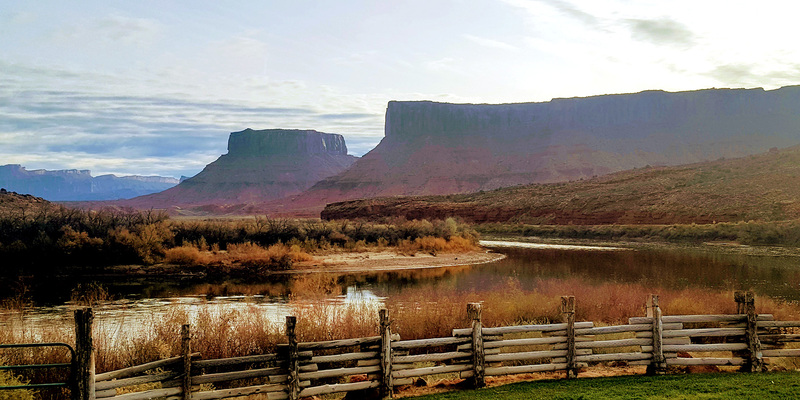 It was late in the fall, right before Thanksgiving and as it turns out, a great time of year to visit Moab. My husband and I needed a break from the day-to-day-doldrums and after a short discussion we decided to take off for the long weekend. I quickly made last minute reservations at our favorite lodge, at the same time convincing myself that just because I made reservations at a lodge I had surely not lost my wild. We loaded up Mitsi, our trusty RAV4, with all the usual adventure gear; backpacks, water bottles, granola bars, emergency kit, sleeping bags (just in case), clothing, hiking boots, and of course swimwear. I am not sure what I was thinking because the weather was to be a balmy 58° by day and at night the lows would dip below freezing. We certainly wouldn’t be taking a dip in the nearby Colorado River, but I felt the need for a swimsuit nonetheless. Once we arrived at the lodge, we ate dinner, and went outside to view the stars but it wasn’t dark enough because of the nearby lights, so we decided to head to bed early. Early to bed, early to rise, or so we hoped. The next morning, we were greeted by the sun as it rose over the canyon walls, the mighty Colorado glistening as it twisted its way down the canyon, conveniently in front of our room. The surrounding cliffs seemed to soak up the light of the sun and looked as if it were on fire. The walls burned a warm, bright, red, contrasting the black and orange streaks as if a child had melted a box of red, orange, and black crayons together. The ice along the edges of the river sparkled as it clung to the willows as the swift Colorado River attempted to take it on the ride of its life, and the light mist that covered the water slowly burned off as the sun soared higher into the morning sky. With great awareness of our surroundings we packed our backpacks and cooler, headed into town to eat breakfast at a local diner and decided where to go for the day. We had originally planned on going into Arches National Park, but the ruggedness of the landscape didn’t feel quite wild enough. Mitsi had a plan for us though; and with that, we drove forty miles south of Moab toward the Needles District of Canyonlands National Park and somewhere along the way, as we drove past the Hole-in-the-Wall and Newspaper Rock, we reverted to our old paper map since the Needles District doesn’t capitulate to modern-day GPS units. Most visitors travel towards Island in the Sky located in the northern region of the Canyonlands; and I’ve been there, but this time, it wasn’t for me. I wanted that truly distinctive off-the-beaten-path experience. 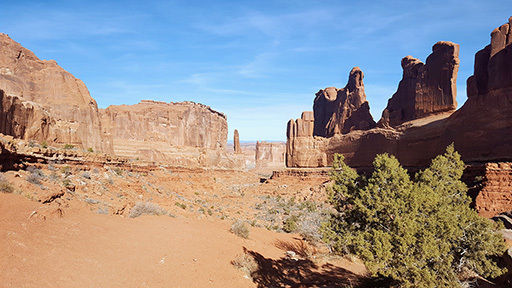 There are hundreds of miles of dirt roads throughout the Needles, some suitable for two-wheel drive vehicles but most of them require a high clearance four-wheel drive, not to mention a plethora of hiking trails available to explore. Even though the Needles District is typically much quieter than the more popular areas of the park, I knew this was the place to find my wild. We drove through the park and followed the road toward the trailhead, parked Mitsi and headed up to a nearby plateau. As we stood on the flat-topped mesa with the warm sun on our faces, and a gentle breeze, we were greeted with vantage points that spanned thousands of miles. An extravagant open vastness without another human being to be seen. In fact, we spent the entire day hiking and only saw one other couple late in the afternoon. We hiked along a mixture of slickrock and sand with only a few narrow spots and steep passes and spent the day driving through the park, stopping, then hiking, driving, stopping, and hiking again taking us to the most amazing places along the way. We hiked the Roadside Ruin Trail which happens to be one of the shortest hikes in the park; so short in fact that I questioned whether my daughter was right and if I had, in fact, lost my wild. 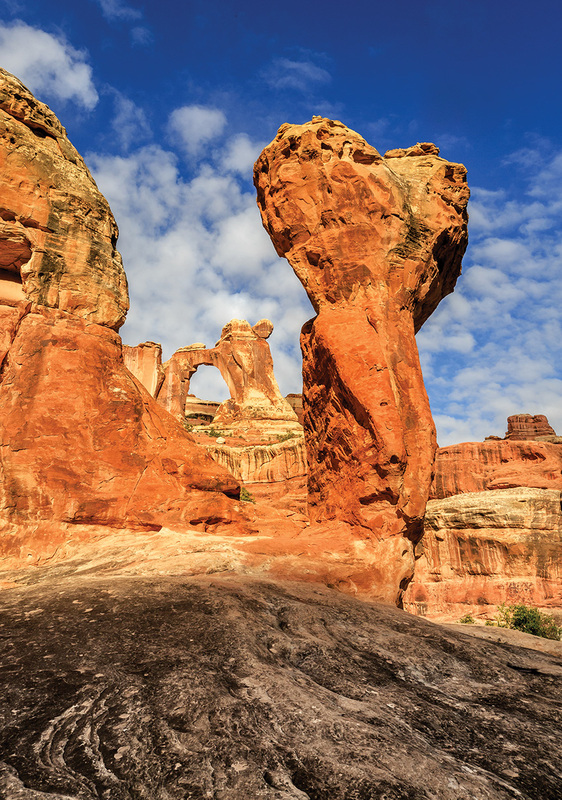 Nevertheless, it’s great for stretching your legs and it will lead you up to an ancestral Puebloan granary allowing us to ponder the ancient Native American lifestyle thousands of years ago. Not far down the road we stopped at Pothole Point, a trail that explores the diversity of life living in the communities of ephemeral pools. As I knelt, peering into one of the pools I felt my inner wild come to life, that nerdy side of me that loved places like this. I felt like shouting to my daughter, “See I haven’t lost my wild!” but she wasn’t close enough to hear me. The landscape was dry and so many of the pools were dried up. It is places like this where these tiny microscopic creatures must disperse to larger pools or somehow adapt to tolerate the drastic physical and chemical changes that occur to the body when dehydration sets in. Once we made the loop it was time for lunch. We drove down the road and stopped for lunch close to the Slickrock Trail. I popped the hatchback, pulled out the cooler and picnic supplies and made our lunch. With all the commotion and smell of gourmet ham sandwiches and Pringles wafting through the air, I had attracted a small fan club of ravens who were convinced that I was going to feed them. They had their usual ring-leader who was curiously brave and had come close enough that I questioned if he would jump in the back and help me make lunch. I knew better, are oftentimes our famous last words, but I thought, what harm could there be if I give him just a couple of sunflower seeds. I tossed a couple of seeds his way, landing on the ground next to him, and watched him with great fascination as he pounded his beak on the seed, cracking it open to eat only the seed inside, no shell. As I handed my husband his sandwich, the raven fluttered up to meet me face-to-face, startling me with the swoosh of his wings. Ravens seem much larger when they are so close to your face. He landed back on the ground with this look on his face, as if he were laughing at me. I thought I could shake him off and I walked across the parking lot, but the raven walked across the parking lot too. I told him to go away but it was too late. So, we closed the hatchback, jumped inside and drove down the road and parked a couple hundred yards away in hopes of leaving him behind, but upon opening my door, the raven swooped down from the sky, landing on the ground next to me. It seemed I had made a friend. I had heard how smart ravens are so I set another seed on my driver’s side mirror. He looked at me as if I questioned his intelligence, which I did, and without missing a beat, he jumped onto the side mirror in a rather matter-of-fact way, looked me square in the eye, pecked the seed and ate it leaving the shell between his feet as he sat staring at me in the driver’s seat. I shut my door and he flew off for a moment. I rolled up my windows and he sat on the hood and pecked my windshield. He had such force, I honestly thought he was going to break it. We finished our lunch and decided to make a break for it, hoping we didn’t return later to a broken windshield. The Slickrock Trail was beautiful and featured breathtaking expansive 360-degree views with almost every step you took. As we hiked along we could see the raven fan club sitting on Mitsi and pecking at her. They must have known we left the sunflower seeds inside. Occasionally one of them would fly overhead and screech at us as if cussing me out for not leaving the bag where they could get to it. We hiked for a couple of hours in utter silence, all of us perhaps afraid to speak and shatter the quiet, as if it would break like glass. Other than the occasional raven, we were surrounded in unavoidable nothingness. The sun was beginning to set as the days were shorter this time of year and the chill of the evening spread quickly across my skin like the tide trickles across the shoreline. The air quickly became crisp and was filled with the smell of campfires wafting through the air. We descended the mountain, walking toward Mitsi only to find a few scratches from the raven’s beak and claws. We drove Mitsi to the Visitor Center, parked and headed inside but something stopped me, so my husband went in without me. As I waited out front I pondered how our National Parks are really some of our best treasures. I pondered our freedom and how blessed I am to live in this incredible nation. I watched the sky as it slowly turned a burnt red and faded into a soft pinkish-orange as the sun slowly drifted below the horizon. As I waited, the Ranger came outside to take down the flag and I watched her in reverenced silence as she lowered the flag, placing it across her shoulder to protect it so it didn’t touch the ground. She walked toward the building with the flag in her hands, stopping mid-stride, as if that same invisible force field that stopped me from entering stopped her as well. She turned to me and asked me if I would like to help fold the flag. I emphatically said, yes. I was honored to fold my flag. My American flag that flew in my American National Park. It was in that moment as the flag stretched between the two of us partially folded that the sun sunk down below the horizon, my husband walked out, saw me and smiled. I am not sure what he was thinking but for me, that moment was as if I stood in a great cathedral of sorts, participating in some out of body experience that was so real it simply took my breath away. The ranger said a kind thank you and walked in the building, as her long black hair blew across her face. As we walked back toward Mitsi I found myself a bit choked up. We drove the long dark forty plus miles back into town, found a place for dinner and then went back to the lodge. We pulled into the dirt driveway and parked in front of our room. I went out back and as I stood there watching the Colorado River flow past me in the dark in all its wild I realized I hadn’t lost anything and certainly not my wild. Just like that mighty river, we go through seasons; some are calm and quiet, and some are wilder than others.